It’s not quite the same decision process as choosing between a Saint Bernard and a chihuahua. After all, domestic cats are all within a much narrower size range than can be found in doggiedom. Furthermore, dogs have been bred for centuries to perform specific tasks, such as herding sheep or retrieving the hunter’s prey. Cat owners can only counter with the emphatic proclamation that in all these thousands of years, no one has yet invented a better mousetrap. In fact, for someone who didn’t know, it might be hard to explain why cats have taken over as America’s favorite pet. After all, unless a person has a barn or granary that needs protecting from rodent incursion, all that a cat can actually do is to be a pet. Cats do seem tailor-made as a perfect fit for the human lap. Their grace and elegance is unparalleled, and their play can be a source of entertainment for young and old alike. Above all, they purr – that marvelous, soothing, calming purr. These are characteristics of all domestic cats, so how do you narrow the choices? It is purely a matter of personal taste or preference. The only “wrong” choice is a mismatch that could later lead to severing that bond, with the cat ending up in a shelter. A little thoughtful consideration beforehand can minimize that possibility. Perhaps the most basic choice deals with how much grooming is required. Longer hair generally means more grooming. Longhaired cat owners often say that the act of combing their pet is a soothing, satisfying activity, and actually adds to their enjoyment. Shorthaired cat owners appreciate what they believe to be their low-maintenance pet. Oddly enough, if shedding is a major concern, the longhaired cat might be preferable. All cats shed, no matter their coat length, but short hair tends to imbed in upholstery and clothing, while longer hair is easier to remove. Certainly the sheer numbers of cats available, and the hundreds of different color and pattern combinations mean that there is a cat for anyone’s taste. Thirty-five breeds are currently recognized by The Cat Fanciers Association, Inc., five more are seeking recognition, and additional breeds are recognized by other registries. The advantage of the pedigreed cat is the predictability of size, appearance and temperament, and you can choose one that seems very likely to fit into your lifestyle by way of activity level, grooming and other factors. The most obvious advantage of a random-bred cat is easy availability and cost. Most pet cat owners now have their pet cats neutered or spayed (87 percent according to several studies) so the number of “free kitten” advertisements and signs are disappearing rapidly. Still, shelters and rescue groups can supply the potential adopter with a nice selection. 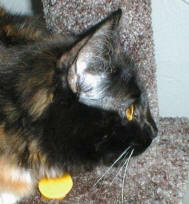 There is even the occasional pedigreed cat that can be found in shelters, or through purebred rescue groups. Couch Potato or Whirling Dervish? Temperament in cats is quite heritable. When choosing a pedigreed kitten, the temperament is relatively easy to predict, and the potential new owner can spend time with the parents of a kitten to determine if there is a perfect personality match. In random-bred cats, though, a general rule of thumb can help. Picture a straight line – a continuum. On one end of that line, place a heavy-boned, “cobby” cat – short-bodied and broad, such as the Persian. On the other end of that line, place a long-legged, slender, “refined” cat, such as the Siamese. All other cats with medium or moderate body traits will range along in the middle of that line from the one extreme to the other. The heavy, cobby cats will generally be the less active, more laid-back cats; the more refined the cat – the more “built for speed” – the more active and inquisitive he is likely to be. While a kitten can be absolutely adorable, he also requires a great deal of work, and can be destructive during that “adorable” stage, which lasts such a relatively short time. Some people insist that the early bonding with their kitten is worth the work; others prefer to meet their new pets as adults so that they can better see the mature personality. One Cat Or More Than One? In this question lies the key to understanding at least part of the popularity of cats. They are small enough and easy enough to care for, even in urban apartments, that a family can experience the advantages of having a pet for more than one preference. Maybe one child wants a laid-back cat that will tolerate being dressed in doll clothes, and another wants a cat that will be fully interactive in games of chase and fetch. Mom may want a quiet companion, while Dad may want a communicative cat. Behaviorists know that while cats can easily adapt to living as single pets, the “buddy system” can produce happier cats and can even reduce the “mischief” that a single bored cat can contemplate.